Our Cabernet Bordeaux Blend embraces all the complexity that is the heritage of the long, cool 2009 growing season. The depth of color, aroma and flavor is amazing with an over-the-top fruitiness that is paired with a rich and long-lasting mouthfeel. 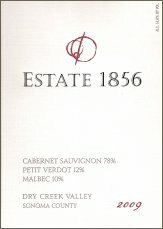 A deeply rewarding marriage of Cabernet Sauvignon, Petit Verdot and Malbec. This blend captures the essence of four Cabernet clones (two American and two French) as well as French clones of Malbec and Petit Verdot. While we could field blend these winegrapes, we go through the more laborious process of fermenting each varietal and each clone separately. This allows us to not only ensure that each clonal selection shines after fermentation, but also allows us to choose the best varietals and clones for eventual inclusion in the blend. As bottling approaches, we spend many months playing with multiple iterations of blend possibilities, finally narrowing down our favorites until a clear winner emerges. We spend much time micro-managing these blends as they are so important to the taste of the wine. The 2009 Cabernet Bordeaux Blend was barrel aged in 100% French oak for 22 months. FOOD PAIRING NOTES: This Cabernet Blend would best complement a main course of succulent red meat. We’d suggest Rib-Eye Steaks with Gorgonzola Butter and Crispy Sweet Onion Rings.